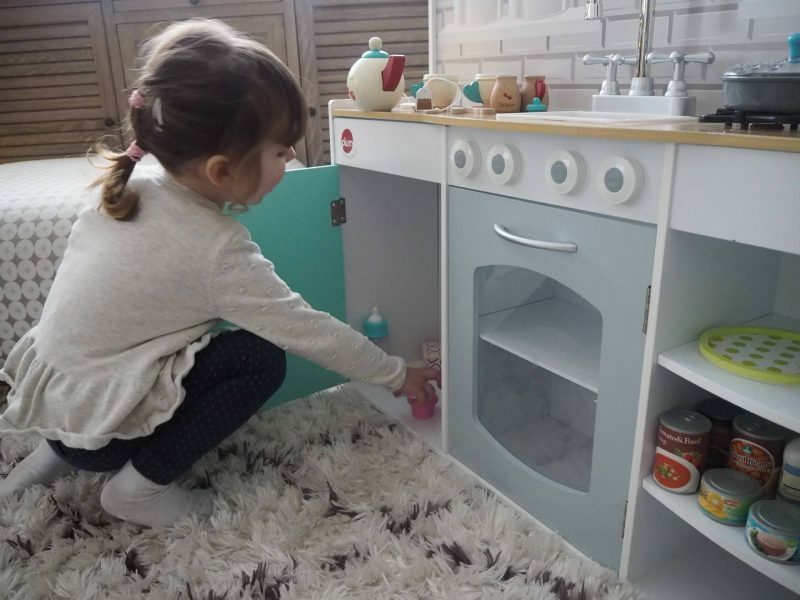 What A Clever Idea…The Peppermint Townhouse 2 In 1 Kitchen and Dolls House From Plum! When I was pregnant with Holly and found out I was expecting a girl, I automatically assumed I would have another little Alice. But I couldn’t have been more wrong. My girls are really different, their characters are poles apart and whilst as Holly gets older she does look more like Alice. They have different features, hair colour and the one thing that is the same is their eyes. One of the big differences between them is how they play. Alice needs someone to play with her and doesn’t just play on her own. She never has done. Thankfully now she has a little sister to play with her. Whereas Holly is the complete opposite. She plays on her own happily all the time. With Alice being at school for the last 18 months she has been the only one at home during the week and she is more than happy to sit and play with her toys. It’s really nice to see the toys that we’ve brought actually being played with and appreciated. 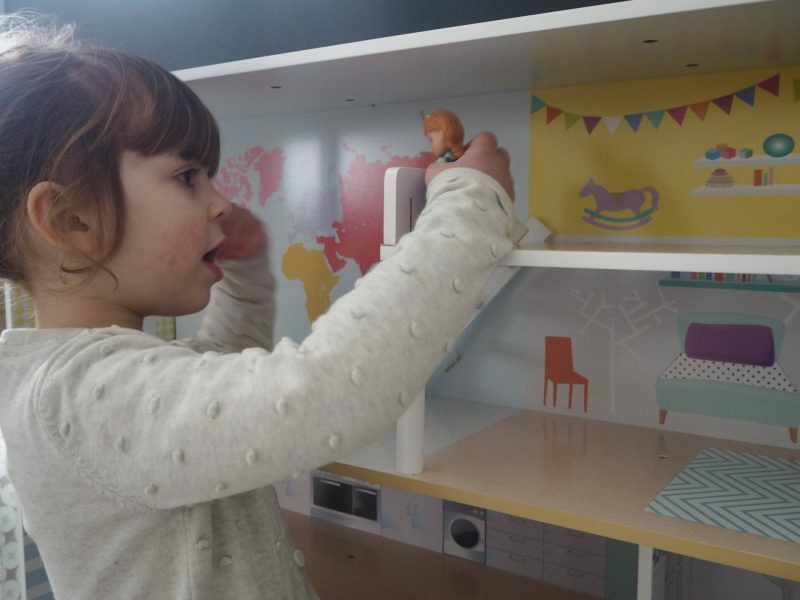 When Plum got in touch to ask if we would like to review the Peppermint Townhouse 2 in 1 Kitchen and Dolls house I knew that Holly would love it. I also thought it sounded like a clever idea and couldn’t wait to see it. It comes flat packed and after spending an evening putting it together with Andy (thankfully with no mention of getting a divorce!! ), we couldn’t wait to see the girls faces the next morning. 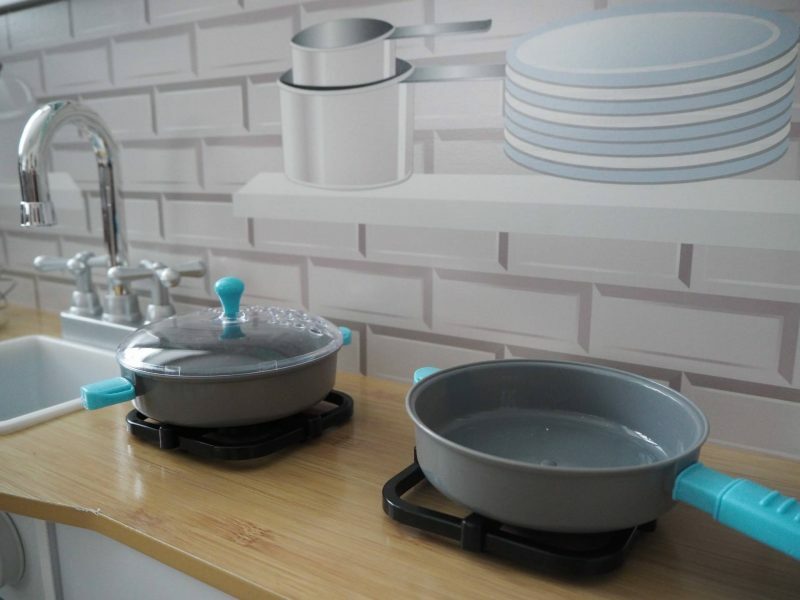 The kitchen comes with 2 saucepans and a set of kitchen utensils. Everything else that you see in the photos, are our own items and they didn’t come with it. Just to set your expectations if you’re planning on buying one! 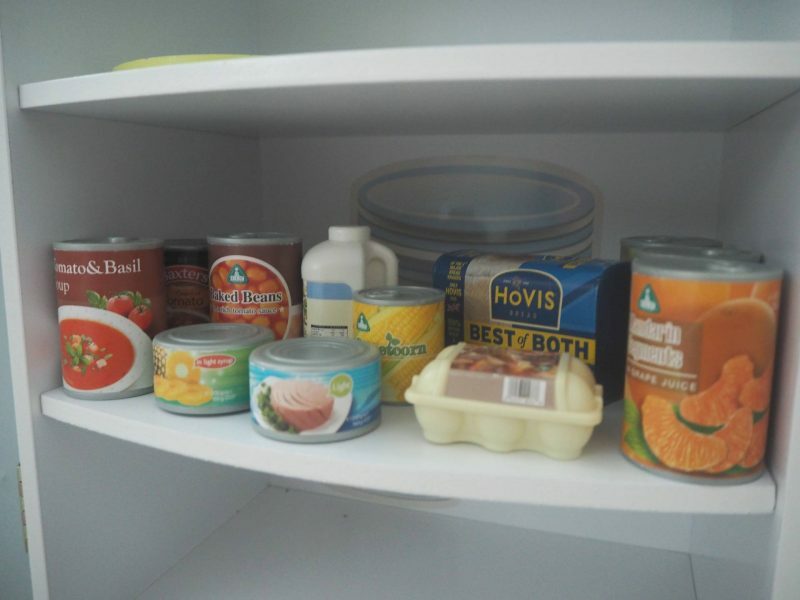 The kitchen has lots of space to put more items in it. I like the details that come on the backs of the shelves. 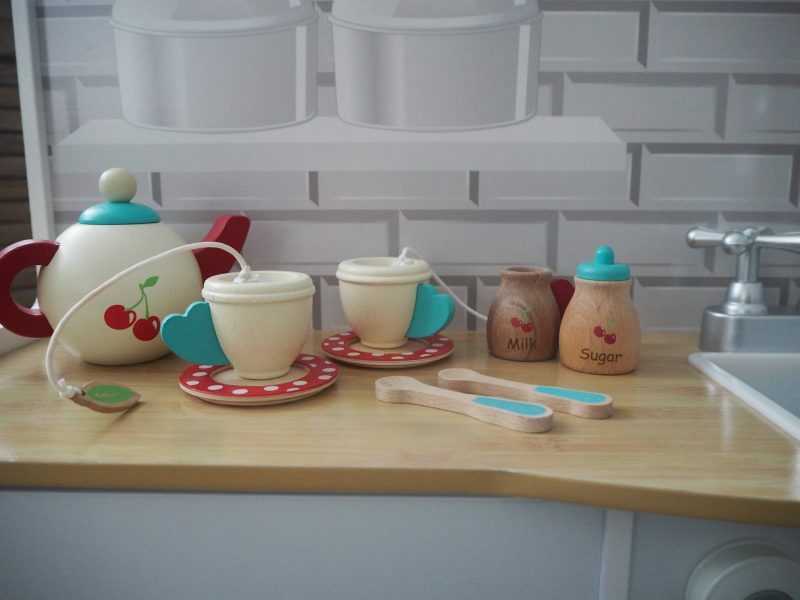 Holly got her tea set out one day and it fitted nicely on the kitchen top. Making cups of tea for everyone is one of Holly’s favourite things to do. 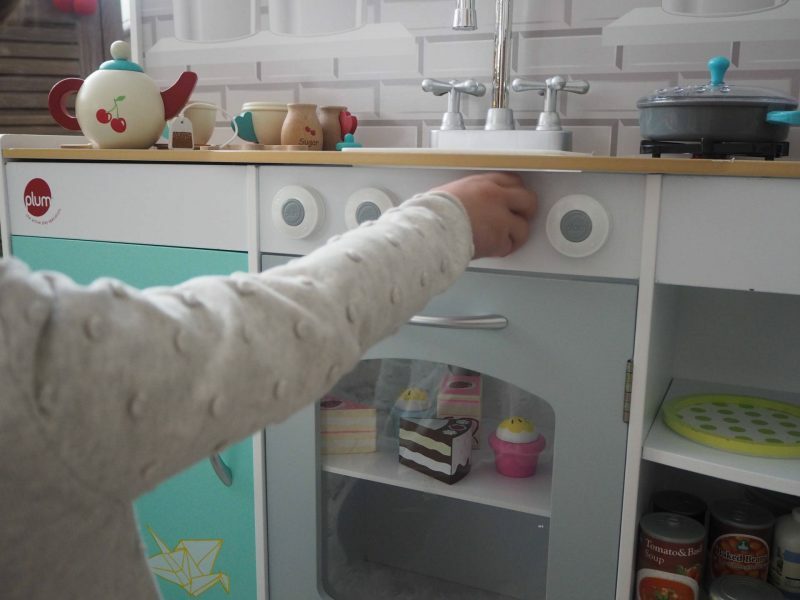 The kitchen comes with an oven and the oven nobs move around, which Holly thought was great and just like mummy’s. She was baking some cakes for us to have with our cup of tea! There is a sink with taps, but thankfully no water!! 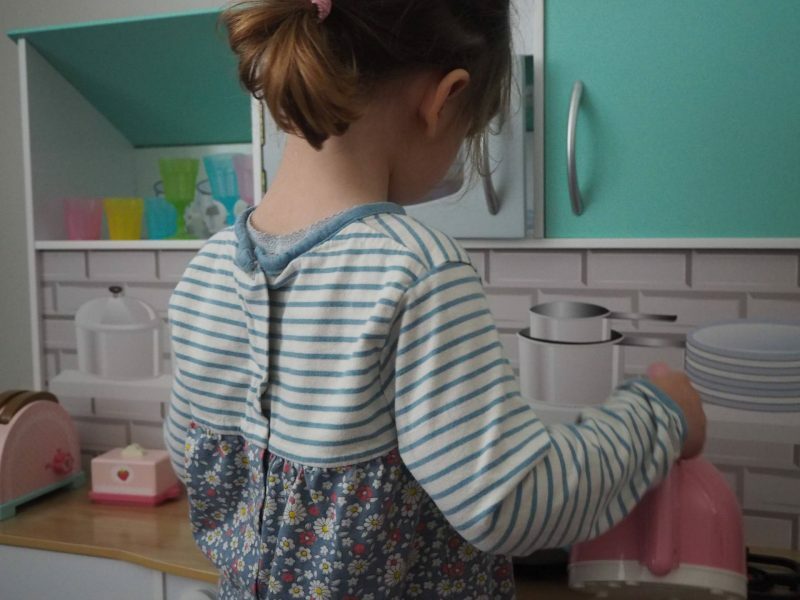 Holly has loved playing with the kitchen and I love watching her little imagination come into play. You can just imagine Holly’s excitement when I turned the kitchen around to reveal the dolls house on the other side. 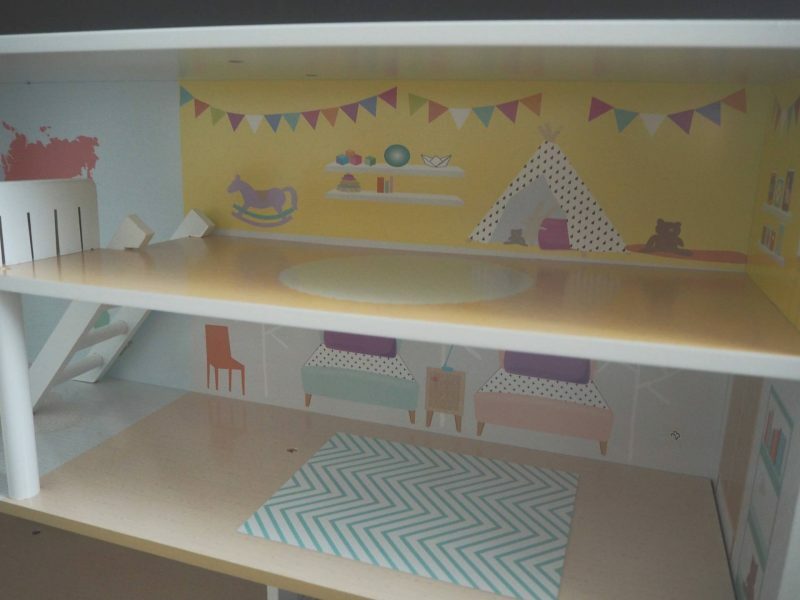 The back of the dolls house is printed with all the room details and you can clearly see what each room is. 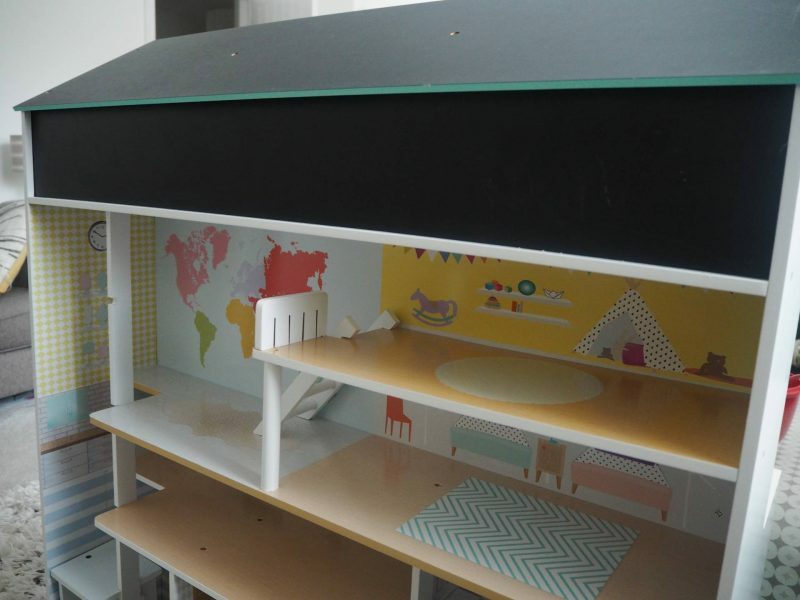 The roof of the dolls house is a chalk board, which is a great idea and I know it won’t be long until Alice and Holly are both writing on it. To one side is a lift, that you can move up and down with your hands. 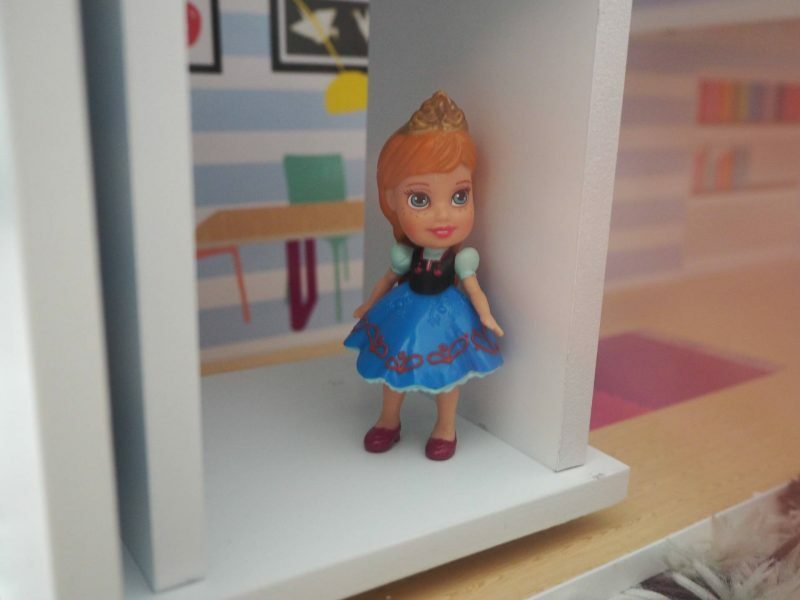 Holly got her little Anna doll and enjoyed playing with her in it. The dolls house doesn’t come with any dolls or furniture and I think that if we buy some to go in it, then it would make it more fun to play with and Holly would have played with it for longer. Since we’ve had the Peppermint Townhouse both my girls have loved playing with it. It’s lovely to see it bring them together and they’ve had lots of fun. 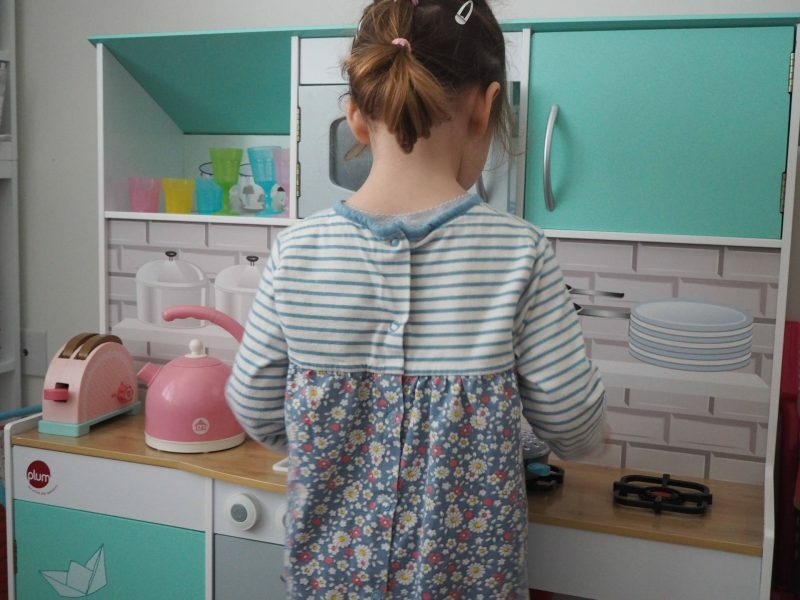 I think it’s a really clever idea to have a kitchen one side and a dolls house on the other side. If you don’t have much space then this would be perfect. Whenever we’ve been home, Holly has been playing with it and I can see that it is going to be well loved and used for many years to come. 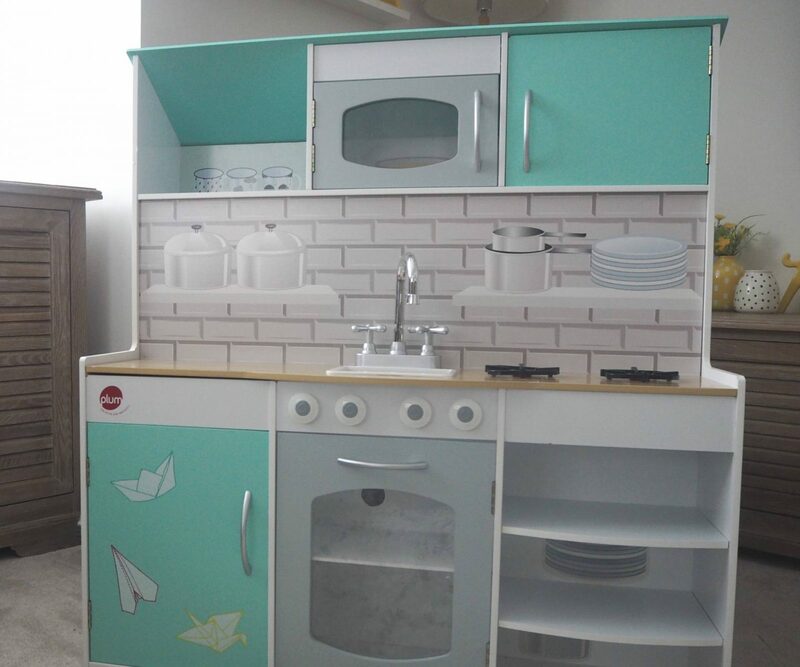 The Plum Peppermint Townhouse 2 in 1 Kitchen and Dolls House is priced at £199.99, but it’s currently on sale at £149.99. Plum are running a giveaway over on their Facebook page for you to win a Peppermint Townhouse, along with a BKD baking kit. 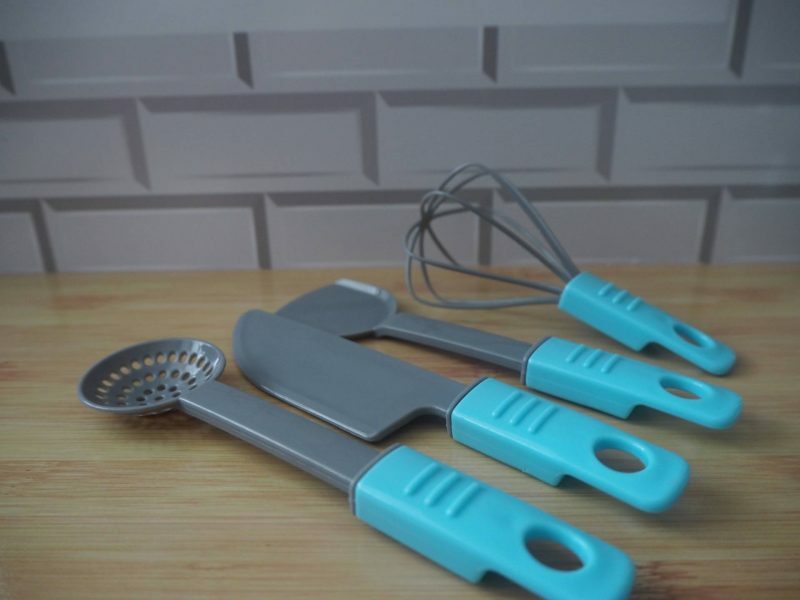 The giveaway closes on Sunday 10th December, so be quick and head over to enter. Click here for the giveaway post. Also did you know that in last years John Lewis Christmas advert, it was a Plum trampoline that we saw featured in it! 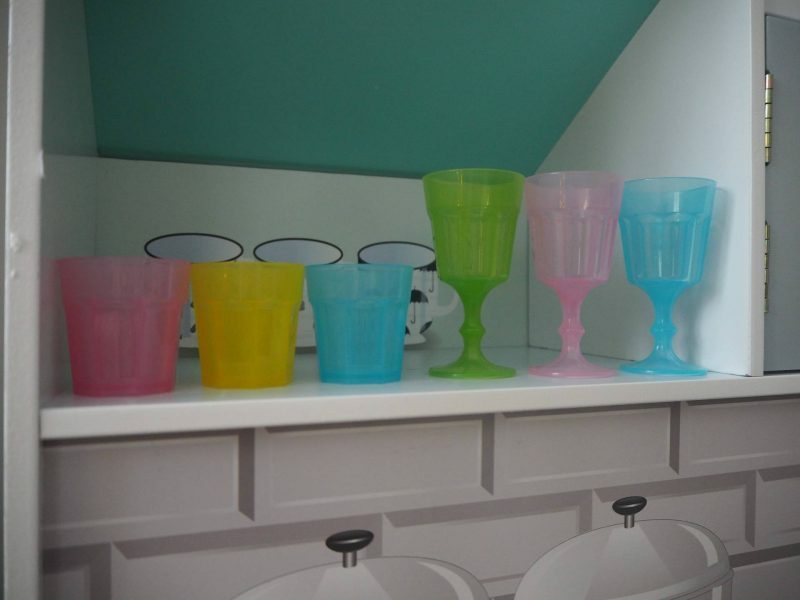 Well over on their website Plum are giving you the chance to win one along with a £100 John Lewis Gift Voucher. It closes on the 14th December and you can enter here. Disclosure: We were kindly sent our Peppermint Townhouse in return for an honest review. All views, photos and opinions are my own. What a gorgeous product. I love how it’s a 2 in 1, so handy for saving space. 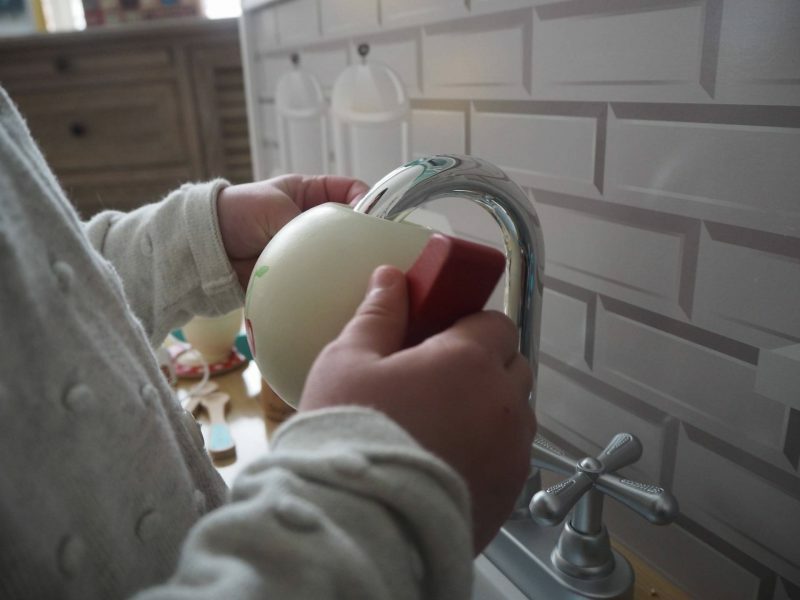 I love toys like this, just brilliant creative play toys. In your first picture I thought it was a teeny tiny kitchen to go in a dolls house! 😀 My daughter would have really loved both sides of this, in fact she might still help her teeny brother play with it now even though she’s 13 in February! This looks absolutely gorgeous! The colours are fantastic and gender neutral too, which is great! 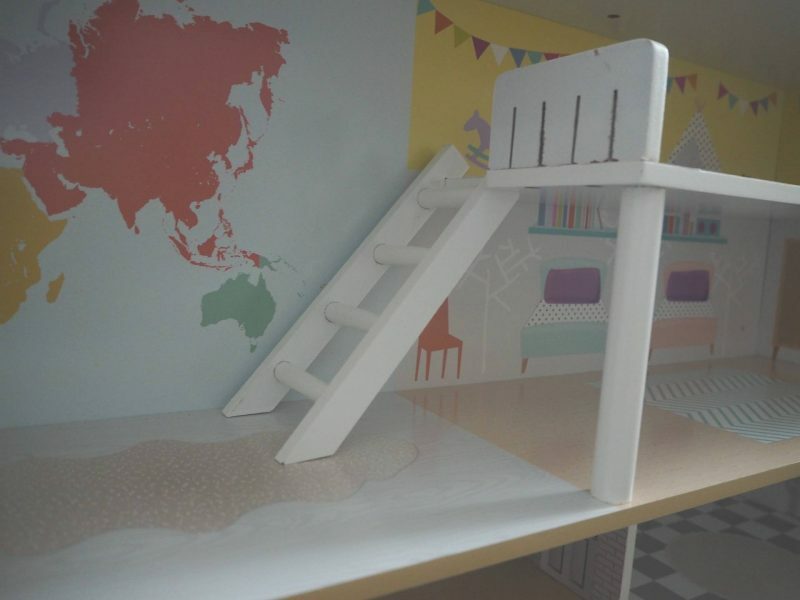 We have a play kitchen and it gets used so much. It’s not quite as impressive as this one though! This is a brilliant idea. I do think companies are finally getting the fact that we just don’t have the room for all the toys! Despite the want to buy them. This is the first I have seen a combination like this though. I wonder if Father Christmas will bring Holly some dolls furniture this year?